The writers group at Nara's Nook has started a learning and production project using the guide book "The 90-day novel," by Alan Watt. To contribute to the project without spending the time on a novel, I am writing a short story or small play using some of the guidance from the book. Jane, Plain Jane: Part 6 I can't believe it! 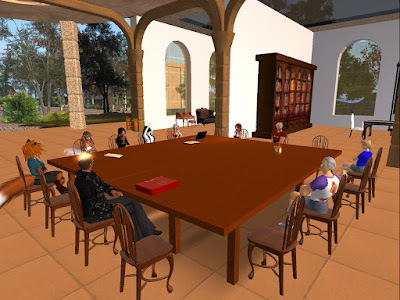 The writing communities of virtual worlds. What do they offer to writers? The writer's meeting at Nara's nook meets Mondays, 6 PM California time. Scroll to the end for instructions on how to get to the meeting. Singer Girl built a web-world. Infinite Metaverse Alliance, organization for the metaverse. A video taken at the Pride Bar Opening Party on Lighthouse Point Grid. "Thank you for everyone who came along had allot of fun. A special thanks for DJ Rocky for playing a great set." This is Leighton's grid. Leighton can keep it somewhat private. But the security/privacy in virtual worlds is probably not enough for therapy. 2017 OSHG: Would Kitely offer Halcyon as an optional version of opensim? an optional version of opensim? Speculation on the possibility of Kitely running Halcyon as an optional alternative to the current OpenSimulator, with Hypergrid travel only available from the OpenSimulator worlds. The special mode of operation that Kitely uses might make it possible to run Halcyon as an option on the Kitely grid. Halcyon is not ready as a substitute for the dev version of OpenSimulator. It does not have Hypergrid capabilities. That is a deal-breaker for most of us. But maybe not for Kitely, because of the way it operates. Master game builder Valerious Strongborn has now developed a guitar player game for OpenSim. It combines a guitar prop, player animations, chords played by the guitar prop, and a game arrangement in which the gamer selects a chord and scores a point if it is the right chord for the song. Could it be a learning tool? so he made props and animations. Then he made a playable game out of it those things. Konk Combat Game Builder, NPC interactions. Metaverse Tour. This week the Short Poetry Workshop present the Terza Rima, which is a three line stanza Italian form with an interlinking chain rhyme. So join us at the Short Poetry Library to learn, write and share your Terza Rima. 2017 WRITE: PEOPLE: Jane, Plain Jane: Part 6 I can't believe it! The metaverse tour visited the Outworldz grid. and picked the world depicting the Virunga National Park. Wanderer got a video of our adventures among the elephants and gorillas. No login at Ourworldz. You go there from any HG enabled grid. Because Outworldz uses a dynamic DNS, there may be a problem finding it. Don't give up. Just try again another day. Here is the chatlog from the first IMA Advisory Board meeting, with minor edits and hypertext links.